Another great article from my South African friend. Lara, thank you again. Hunting wild animals evokes strong emotions. Some are entirely justified, but tears have a tendency to blur our vision. What might seem cruel sport to some of us is a visceral challenge to others, and the economic incentive hunting creates is critical to the welfare of many animal species. From time immemorial, man has hunted beast. Whether it be for food, to protect farms and villages, to improve his competitive social standing, or simply to prove his ascendancy over nature to his own self, it is ingrained in the collective psyche of most cultures. Apologies for using the male pronoun. While I can sometimes be tempted to stoop to the grammatical crimes and stylistic dissonance necessary to preserve an accurate and fair gender-neutrality, I’ll wager that few female hunters will object to the notion that historically, hunting has been both by nature and by numbers a mostly male endeavour. There are, of course, exceptions, as we shall see. But back to our potted history. As society advanced, humanity betook itself to cities, fenced off its farms, and left the tough business of meat production – and keeping those domesticated animals safe from predators – to a select few farmers who had the stamina for it. Having built fences, roads and cities, however, this left us with a unique responsibility to conserve and manage our natural resources. Some are of the view that what is left of nature should be left untouched, a holy shrine to the Earth Goddess. The more extreme among them are positively misanthropic, decrying human overpopulation and prosperity, while granting animals rights that trump those of human beings. Others are of a more pragmatic bent, and are comfortable with the idea of managing the environment responsibly with sound economic objectives in mind, and that this, besides farming animals for meat, may well include recreational hunting. The anti-hunters portray hunters as cruel, violent thugs who’d shoot Bambi right in her doe eyes just to watch her head explode. The hunters, conversely, portray anti-hunters as petty-fascist, addlepated bunny huggers without a clue where their leather shoes come from. In each group, there are extremes that do fit these descriptions. But forgotten in the heated rhetoric is a calm, rational view of hunting and its potential role in conservation. There is no reason why conservation and hunting need to be mutually exclusive, and why they cannot fulfil complementary functions in a sensible environmental management regime. The core difference between the two sides is that one wishes to limit the economic value of wildlife reserves to photographic tourism, while the other believes responsible hunting also has an important contribution to make. Let’s consider the numbers. Dr Gert Dry, the deputy president of Wildlife Ranching South Africa, broke them down for a green economy conference in 2010. Of South Africa’s 122.3 million hectare land area, 7.5 million hectares, or 6.1%, are protected by government as national parks. Much more – 20.5-million hectares or 16.8% – is owned by private landowners who operate commercial game ranches. Half of these ranches are in Limpopo, with another third in the Northern Cape and Eastern Cape. This compares to 100.6 million hectares of agricultural land, representing 82.2% of the country’s land area. A typical game farm, according to Dry, employs three times as much staff as a comparable livestock farm, and pays three to four times more, to boot. Over 100,000 people are said to be dependent on the wildlife farming industry. Considering that they are concentrated in South Africa’s poorer provinces, it seems rash to dismiss this socio-economic contribution. Most game farms are located on land that is marginal for agriculture, turning much unproductive land into commercial wildlife and eco-system conservation operations. Per hectare, these game farms produce almost three times as much income as the same land would have produced under conventional livestock farming. Hunting is worth between R2 billion and R3 billion per year, depending on whom you believe. Commercial wildlife ranching brought in a total of almost R8 billion in 2009, reckons Dry. There are no figures for the contribution of photographic wildlife tourism as a sub-segment of the R70-billion tourism industry, according to Mabunda. One might assume it is significant, but Dry estimates its turnover at only R2 billion. However, hunting and photography do not necessarily overlap. The latter can occur in national parks, while the former cannot. Conversely, hunting often takes place in remote areas on marginal land, which is less attractive to tourists. The needs of the two sets of customers also differ. Whereas some game farm facilities are adequate for hunting safaris, they are not good enough to cater to the more luxurious tastes of typical eco-tourists. The business economics of the two sectors are very different, and many areas cannot accommodate both equally well. That’s not to say the hunting industry has no problems. Associations that cater to hunters, such as the Professional Hunting Association of South Africa (PHASA) and the South African Hunters and Game Conservation Association, are often the first to admit it. As one might expect, no measures are perfect – and indeed, a hunting ban would not cure all problems either – but both government and hunters claim to be working at eliminating the worst excesses. If they succeed, what is the impact of hunting on threatened species? Last year, an international outcry over lion trophy hunting made it into the Guardian. Animal activist groups including the International Fund for Animal Welfare, the Humane Society and Born Free, called upon US authorities to declare lions as “endangered” and prohibit the import of trophies. Opposing views from one of the main hunting lobby groups, Safari Club International, were allegedly submitted to the newspaper only to be sidelined. In any case, the numbers simply don’t add up. According to the IUCN Red List, lions are merely classed as vulnerable, which does not prohibit licenced hunting. Populations are hard to determine, and with low certainty, the IUCN cites numbers ranging from 16,500 to 100,000. Let’s assume it’s somewhere in the middle, at 40,000. This concurs with the Guardian’s numbers, and is indeed lower than the 200,000 that once roamed the sparsely inhabited African plains. However, short of shooting half a billion Africans, which seems rather less defensible than shooting wild animals, there is no simple solution to the animal-human conflict that occurs whenever populations compete for space. More importantly, it doesn’t seem that these numbers are declining in areas where they are well-managed. In the Kruger Park, for example, numbers of all the big five – elephants, rhinos, buffalos, lions and leopards – are rising at a healthy clip. No large mammals are under imminent threat, according to SanParks. There is, of course, no hunting in this reserve, but the actual numbers of hunted animals outside game reserves are also low by comparison with their populations. In 2009, for example, 325 lions were killed by hunters, and ratios for the others are similar. Even if you include poaching, which has been rising for some species, notably rhino, at an alarming rate, the story is not (yet) one of calamity. The birth rate of white rhinos, for example, continues to exceed the rate at which they get killed. Environmental economist Michael ‘t-Sas Rolfes has written a paper documenting the contribution that hunting has made to saving the white rhinoceros. In 1900 they were on the brink of extinction, with only 20 specimens remaining. By 1991, there were just over 5,000. A change in legislation occurred in that year, and since then, their numbers have nearly quadrupled, to over 20,000, making them the most populous rhino species on earth. It might seem tempting, despite the detailed arguments ‘t-Sas Rolfes offers, to dismiss this as an isolated anomaly: the exception that proves the rule that the private game farms, the profit motive and recreational hunting are bad for the survival of threatened animal species. Tempting, but wrong. There is an even more spectacular example involving exotic African animals. It took place far from our shores, however. The largest concentrations of exotic and endangered species on earth can be found on game ranches in the US state of Texas. They exist, in healthy, growing numbers, for the sole reason that they supply a market for hunting. The CBS show 60 Minutes did a fascinating investigation of the cases of three species: the scimitar-horned oryx, the addax and the dama gazelle, all of which are extinct in the wild, but roam the Texas plains in their hundreds. While the opponents of hunting cling to idealistic fantasies of herds running free across the African savannahs, unthreatened by human encroachment, the reality in many countries where these animals ought to have been native is one of widespread poverty, occasional war, lack of institutional capacity and ultimately, political indifference. There’s a reason they’re extinct there. The anti-hunting lobbyists’ dreams had no chance. Meanwhile, the supposedly cruel hunters are the ones that have saved the species. PS: It has been brought to my attention that Dr Gert Dry has become president of Wildlife Ranching South Africa since giving the speech quoted above. The following was written by a friend of mine from South Africa. She is a brilliant lady who truly loves her country’s wildlife. Thank you Lara. Rhinos — priceless or worthless? In many ways, a rhino is an odd-looking creature. Even its name, meaning a creature with a horn on its nose, betrays its unusual appearance. So if you had a sudden urge to put a horn on your head, not use your knees and chew on some leaves, you may be catching the spirit of World Rhino Day. It was celebrated in Zimbabwe at the weekend and all over the world with art shows, auctions, walk-a-thons and lectures with the theme of Five Rhino Species Forever. The effort was to raise awareness for the threats posed to the rhinoceroses hunted for their horns believed to have medicinal properties. Rhinos can be very big, with the two largest of the five species weighing up to 2,7 tonnes and standing six feet high and up to 15 feet in length. This makes them second only to elephants as the world’s largest land mammals. Yet in spite of their size, over short distances they can move at speeds of up to 48km per hour and can turn very sharply. You don’t want to be chased by a rhino. Rhinos also have the unfortunate distinction of being one of the most endangered animals on earth. For over 100 years, the rhino has been subject to dedicated conservation efforts, but in spite of this, since the 1970s the world’s rhinoceros population has declined by over 90%. Agreeably poor performances by African countries could be threatening the survival of wild rhinos, tigers and elephants. Yet conservationists might not bother rescuing other species such as a giant soft-shell turtle or a pygmy three-toed sloth because these animals don’t provide any clear benefits to humans. As Zimbabwe commemorated Rhino Day, I wondered how we should decide which endangered animal species to focus on saving? First, the usual culprits – habitat destruction, pollution, hunting, and climate change. There’s another problem: unlike cuddly or “charismatic” endangered animals like tigers, the African painted dog, pangolin – or even the appetite-suppressing hoodia cactus, which has obvious medicinal uses – these endangered species are dangling precariously close to extinction because of the simple fact that they don’t offer humans any clear benefits. In many cases, people don’t care enough about these species to intervene. So are these species worth devoting limited resources to saving? The donor community and conservation movements are increasingly leaning towards a “what can nature do for us?” approach, where species and wild habitats are valued and prioritised according to the services they provide for people. Well, saving every single species is an “enormous undertaking”. Yet it’s often better to save “umbrella species like tigers, elephants, and rhinos” in order to protect the habitats they share with other endangered creatures. Scientists fear that these plants and animals are at the greatest risk of extinction because, quite simply, they don’t offer any obvious or immediate benefit to humans. Of the world’s five species of rhino, two are found in Africa in particular Zimbabwe or southern Africa – the Black rhino and the White rhino, while the other three species are found in Asia. These are the Greater One-Horned (Indian) rhino, the Sumatran rhino and the Javan rhino. The Javan, the Sumatran and the Black rhino are all critically endangered. There are possibly only 48 Javan rhino left, with approximately 200 Sumatran and around 4 800 Black rhino. The Greater One-Horned (Indian) rhino is considered to be vulnerable, with just under 3 000 remaining, while the Southern White rhino is in a better position, although considered to be near threatened, with approximately 20 600. Two sub-species are in a very grave position. There are only seven Northern White rhino left in the world and the Vietnamese sub-species of the Javan rhino is down to only four or five left in the wild. The chief reason for the decline in their world population is that rhino horn is widely regarded in traditional Chinese medicine as being a “remedy” for a whole range of ailments including pain, fever, acne, laryngitis, mumps, herpes, epilepsy and even cancer. Rhino horn is comprised of keratin, which is the same material as hair and fingernails. The front horn of the two African species can reach up to four feet in length, while the Asian species have shorter horns that are rarely longer than two feet. But extensive tests have shown that claims of medicinal properties of rhino horn are completely without foundation, yet its continued use, particularly in China and Vietnam, is pushing these animals ever closer to extinction. Poaching is now endemic. For instance, in the 255 days between January 1 and September 11, 2012, 381 rhinos were illegally killed in South Africa alone – over 10 every week. The scenario is saddening in Zimbabwe and elsewhere as well. On the side of the rhino is the fact that international crime also attracts international law enforcement. South African law enforcers have also voiced suspicion that game farmers and reserve owners are actually killing their own rhinos and selling the horns. When the potential rewards are so high, it is easy to understand the temptation, especially since interceptions and prosecutions are really nothing more than a tip of an iceberg and there is little real chance of ever being caught. Given the escalation of elephant poaching in Zimbabwe and most of Africa and the increased levels of organised crime involved in the trade, it is clear that the situation is now critical. Wildlife crime not only poses a threat to animals, but is a risk to people, territorial integrity, stability and rule of law. Regional co-operation is needed to counter the flows of illegal ivory and arms spilling across borders. As today is World Rhino day I wanted to return to the topic of rhino conservation. While most bloggers, conservationists, and rhino enthusiasts will focus on Africa’s rhinos due to the current poaching pandemic, I would like to shed some light on the plight of Asian rhinos. Asia is home to 3 out of the 5 modern species of rhino. 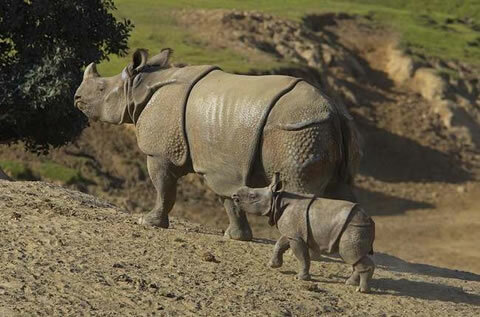 But as of December 2010 there were only 3,100 rhinos left in Asia, this is the combined total of all three species. The vast majority, 2,850, of these were Indian rhinos while Sumatran rhinos accounted for roughly 200 individuals and the javan rhino had a mere 50 individuals left. Compare these numbers to Africa’s 4,880 black rhinos and 20,160 white rhinos and one can see the great danger of extinction which Asian rhinos face. However the story of Asia’s rhinos became even more depressing when it was announce that the Javan rhino was now locally extinct in Vietnam due to the poaching of the last rhino on October 25 of 2011. While poaching for the Asian black market has played a big role in the demise of Asian rhinos, the biggest factor has been habitat loss. Asia’s exploding human population has led to rapid habitat loss as more and more wild lands are destroyed to make room for humanity our urban sprawl. With the conquest of Malaria back in the 1950s even more land in Nepal and India has been made available to human settlement, precious habitat which was taken from the Indian rhino. Vast areas of forests once inhabited by Sumatran rhinos in Malaysia and Indonesia have been cleared, leaving only small islands of forest in which the rhinos can take refuge. This has exposed them even further to poaching as it is now easier for poachers to locate them in smaller tracts of forest. There is hope on the horizon though. Indian rhinos numbered 1,200-1,500 back in 1988 compared to the 2,850 in 2010 as I mentioned earlier. While more data is necessary, they may still be in this upward trend. As for the Javan rhino it still hovers around 50 individuals but major efforts are being taken to conserve them. A team of biologists have been working in the Ujung Kulon National Park promoting conservation of this extremely rare species. They have collecting data on the rhinos within the park as well as fostering good will between local people and the rhinos through community outreach programs in which the biologists and their team have created 3.4 kilometers of piping to bring clean water to the villages and teaching them better farming practices. This good will established between the researchers and locals has been of great benefit to the rhinos as well since the local people can relate this new aid to the presence of rhinos. The team has also proven that the rhinos are still breeding successfully with their capturing of juvenile rhinos on film (which can be seen by following the link to the third reference in the list below). With their prehistoric looks rhinos are awe inspiring beasts. A world without rhinos is not a world I want to raise children in. Hopefully, with enough international support rhinos can be conserved so that future generations will be able to see rhinos, rather than simply believing rhinos are creatures of legend. Africa’s Elephants Are Being Slaughtered in Poaching Frenzy – NYTimes.com. Safari Club International Foundation – Conservation. Home | Wildlife & Sport Fish Restoration — 75 Years.